We have livestock, so we have flies. Since every animal moves around, and leaves their waste behind, it gives the fly an opportunity to lay its eggs. When people ask about what we feed our livestock, we are usually asked about administering antibiotics or growth accelerants. Never once have we been asked about fly killer. Easy enough for an interested person to google a question about cattle and having too many flies around. Up pops many articles and advertisements for fly killers. There are many different types. Most have an effect on the central nervous system of the fly, and kill them by breaking that down. Fly killer can be administered in a variety of ways. Ear tags, powders, oils. Sprays on the ground or sprays on the cattle themselves. The fly killer that I've studied does not discriminate what it kills. Small bugs. That will not do here. We have bees, parasitic wasps, ladybugs, praying mantis, soldier bugs, butterflies and other good and small creatures here. For fly control, we have the bald faced hornet. Crazy to see them carry the flies away. 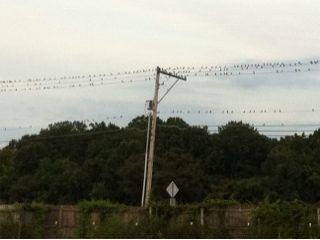 We also have birds that arrive every evening, and chitter chatter in the trees with each other. They line the telephone wires. There are more than one kind found in this area: a phoebe, the least flycatcher, willow and alder flycatcher. Every day at 4pm the birds arrive. We guess that there is something in the life cycle of the fly that brings so many birds here at that time of day. The tiny birds fly around and land on the cattle until there are no more flies, they eat every one. The birds move onto other livestock and parts of the farm before they head out. The bald faced hornets are usually out searching for fly larva earlier in the day. It is crazy to see them tug a fly larva, eat it up and fly back to the large paper nest. Experts report they feed what they have chewed up to their babies. We move our livestock in concentrated groups, in small areas. They leave that spot quickly, which allows these fly eating creatures to gain access to their favorite meal. With almost an acre of woods and acres of high grass and shrubs the birds can find spots to construct nests, the wasps have plenty to build theirs too. And the livestock get relief from the flies on a continuous basis. By not using the fly killers on our cattle we can allow these tiny birds and hornets and all the rest of our pollinators to be here, doing their important work. Clean tasting beef, pork, chicken, turkey and eggs as a result.